Florida auto body shops saw their claims dismissed a third time, with no hope for a fourth, in a devastating blow to many similar cases taking their lead from the Florida action. A&E et al v. 21st Century et al had served as a flagship for the multistate litigation being heard by U.S. District Court Judge Gregory Presnell. Collision repairer lawsuits against insurers in about 20 states have been consolidated in the Middle District of Florida to avoid needless duplication in the federal court system. 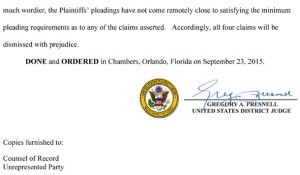 In dismissing all claims with prejudice on Wednesday (see order) — meaning they can’t be refiled as in the past — Presnell seemed to indicate the cases brought by shops in other states would fail on the same grounds. “Based upon a review of the pleadings in this and the other 20-odd cases – almost all of which share the same shortcomings – the Court finds that giving the Plaintiffs another opportunity to state a claim would be an exercise in futility,” Presnell wrote. Messages have been left but not yet returned for plaintiff attorneys at Jackson, Miss.-based Eaves Law Firm, which is handling this and many of the similar actions being heard in Florida. The lawsuit made four steering and antitrust allegations. Price-fixing and boycott claims had been brought under the Sherman Antitrust Act, while quantum meruit (accepting a benefit without paying for it) and tortious interference allegations were made at the state level. The Florida tortious interference allegation failed because Florida law requires a legally tangible connection between the two parties whose business relationship had allegedly been tampered with. This isn’t necessarily a contract, but the plaintiff has at least have “existing or prospective legal or contractual rights” between the parties involved, according to Presnell. Other states aren’t as strict about the relationship. The collision repairers had alleged that as the insurers all were refusing to pay beyond an identical rate and for certain procedures, they must have been working in tangent. They pointed out that insurers who don’t conduct independent price surveys somehow all are able to match State Farm’s practices developed with a survey it has kept secret. Presnell wasn’t swayed, citing law which found that parallel action didn’t constitute a conspiracy without further proof, and the insurers would have quickly found out what rates each other were paying anyway. Presnell dismissed the idea that the defendant insurers’ control of 90 percent of the market share meant they exerted power over collision repair. He apparently rejected the shops’ point about the amount of repairs done for insured policyholders. Presnell also questioned the argument that a single insurer refusing to pay for “full and proper repairs utilizing safe and appropriate parts” would have cost it market share had not all the insurers agreed to the same. But he said this ran contrary to the fact that all insurers have an “obvious” interest in paying as little as they can. There’s also a logical trap in making the case that insurers are refusing to pay for safe repairs, according to Presnell. There’s the quantum meruit case that shops are doing proper and safe repairs, just eating the difference to the insurers’ benefit, but that’s not part of the antitrust allegation. “Beyond the problem with the way this claim has been pled,” Presnell wrote — criticizing allegations made against the group of insurers instead of individually delineating them — he said the quantum meruit claim failed because the insurers didn’t receive a direct benefit based on the shops’ own argument. “The Plaintiffs have not directed the Court’s attention to any allegation within the Second Amended Complaint that the Defendants are themselves obligated to perform repairs, and the Court’s research has not uncovered any,” he wrote. But even if that the allegations were completely true, Presnell wrote, there’s the inescapable fact that “the Plaintiffs knew how much the Defendants proposed to pay” and gave the benefit anyway. Now, this is Florida law, and as unjust enrichment/quantum meruit grounds vary from state to state, other lawsuits or arguments against dismissal might prove more successful. The shops pointed to examples of steering similar to those presented in other states’ lawsuit as proof of boycott, but Presnell said they failed to prove each insurer had been working with the others. “Each of the incidents involves a single Defendant discouraging one of its insureds from dealing with a single Plaintiff (or misleading the insured into refusing to do so); there are no allegations that at the time any of these steering incidents occurred, the other Defendants (or any of them) were also preventing their insureds from utilizing that particular Plaintiff’s services,” Presnell wrote. In Florida, a party with an interest in a business relationship is allowed to talk to one of the parties about it. “However, the privilege to interfere is not absolute, and it is not applicable where the plaintiffs allege that the interference was accomplished by improper means, such as misrepresentations and intimidation,” Presnell wrote. While other states’ lawsuits cite examples of allegedly steered customers who’d been prior customers of plaintiff body shops, there’s no evidence that the Florida shops even knew the customers were going to use them, according to Presnell. When she contacted Allstate, she was informed that if she took her vehicle to one of Allstate’s preferred shops, the repairs would only take nine days and Allstate would provide her with a free loaner car. According to the allegations of the Second Amended Complaint, (the customer) – whose policy did not provide rental car coverage – took her car to an Allstate preferred shop because she “could not afford a rental and needed a vehicle for work”. Though the repairs took nearly a month, rather than the promised nine days, there is no allegation that Allstate failed to provide a replacement vehicle. But in this case, Allstate didn’t misrepresent the fact which swayed the customer, according to Presnell: the rental car. There wasn’t any specific allegation against the shop itself, the judge wrote. It’s worth pointing out that Allstate’s preferred shop allegedly did a terrible job during that month, according to the lawsuit. “Ideal found substantial unrepaired damage, including failure of the DRP shop to reattach the seat belts, unrepaired impact damage that left the gas tank filler neck and housing structure bent such that the gas cap would not close and one of the doors did not function properly,” the case states. Presnell also takes the case — and presumably Eaves Law Firm — to task for the presentation of the complaint. (There are also examples where he points out the lawsuit doesn’t specify which subsidiary was being referenced, stating only the parent insurer’s name.) He indicates he’s out of patience, which doesn’t bode well for the other states’ cases he’s still yet to hear. At the outset, it should be noted that the Plaintiffs have failed to indicate which assertions in the Second Amended Complaint are intended to support which of their claims. None of the four counts explicitly incorporate any of the factual assertions set forth in the pleading. Instead, the Plaintiffs’ 70 pages of “Facts” are simply followed by 17 pages of “Causes of Action,” leaving it up to the reader to divine which allegations the Plaintiffs believe to be relevant to any particular claim. Normally, the Court would remedy this shortcoming by requiring the Plaintiffs to replead. But given the enormous amount of time it has already taken to get to this point in the proceedings, the Court will instead rely on the Plaintiffs’ papers and its own assessment of the document to resolve the instant motions.